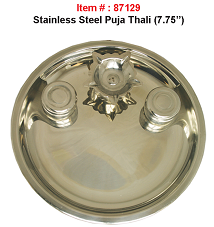 Stainless Steel Pooja Thali Set w/ Diya & 2 Katori 7.75"
Shipping $7.04 Add item to cart for shipping estimate. You can SAVE on shipping by buying multiple items from the same seller. Shipping is charged by each individual seller. Sellers at times may also provide FREE SHIPPING on select items or on entire order if it meets the minimum order value. Please check sellers page for more details. 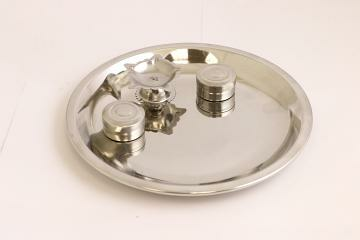 Traditional style stainless steel pooja thali set with diya, 2 small kumkum chawal katori (bowl). Great for your daily rituals in your pooja room or an ideal return gift during housewarming, pooja, navratri or diwali. Minimum order quantity is 3 pcs. Shipping Cost $7.04 Buy multiple items online from Indian Root to SAVE on shipping. This item in Hindu Puja Items category was first added to our catalog on 08-30-2018. Buy Stainless Steel Pooja Thali Set w/ Diya & 2 Katori 7.75", sold & shipped by Indian Root where you can shop online for Exclusive Collection of Ethnic Indian Gift & Home Decor Item. 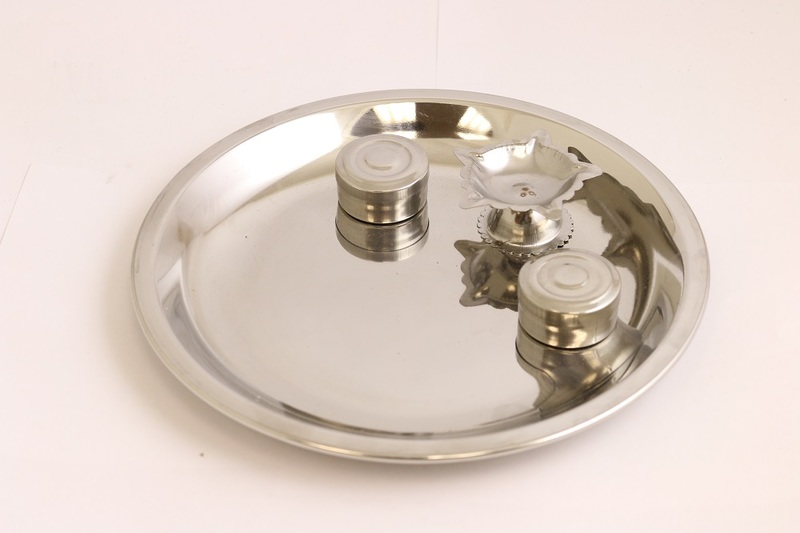 This Pooja Thali collection has been tagged as Pooja Samagri, Religious Item, Traditional Puja Plates Set, Return Gift For Housewarming Gift, Pooja Supplies In Usa, Puja Plate, Kumkum Vati.